Hi. I am 22 years old. Last September I tore my ACL while playing soccer. 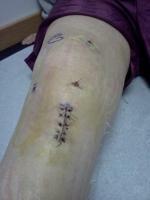 I had the ACL reconstructed using my patellar tendon on October 21, 08. So I am almost 6 months post surgery. I've become a little concerned because I have seen little to no improvement in my knee in the past few months. There is still pain, swelling, and stiffness. My knee also laterally feels loose/unstable and there is some side to side play in it. I guess my question is, is it too early for concern? My Dr doesn't seem to be concerned about anything, and I am looking into getting a second Dr opinion. Anyone have any thoughts? What is normal for 6 months post ACL recon? What are some of the indicators that an ACL revision surgery is needed? Thanks a bunch! This is a cool site!